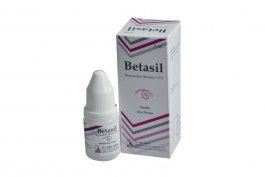 Betasil eye drops (Bepotastine) is a topically active, direct H1-receptor antagonist and an inhibitor of the release of histamine from mast cells. It also suppresses the migration of eosinophils into inflammed tissues and IL - 5 production. Indications : Bepotastine Besilate 1.5% is indicated in itching associated with sign and symptoms of allergic conjunctivitis. Betasil is available as 5 ml sterile eye drops. Florobex is a fluoroquinolone antibacterial named besifloxacin. The compound has activity against Gram-positive and Gram-negative bacteria due to the inhibition of both bacterial DNA gyrase and topoisomerase IV. Florobex is indicated for the treatment of bacterial conjunctivitis caused by susceptible isolates of the following bacteria: CDC coryneform group G, Corynebacterium pseudodiphtheriticum, Corynebacterium striatum, Haemophilus influenzae, Moraxella lacunata, Staphylococcus aureus, Staphylococcus epidermidis, Staphylococcus hominis, Staphylococcus lugdunensis, Streptococcus mitis group, Streptococcus oralis, Streptococcus pneumoniae, Streptococcus salivarius. 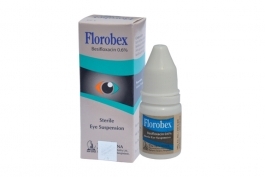 Florobex is available as 5 ml sterile eye drops. Betacin-N is a combination preparation of Betamethasone Sodium Phosphate & Neomycin Sulphate. Betamethasone is a glucocorticoid which suppresses the inflammatory response to a variety of agents. Neomycin is an anti-infective agent; active against most gram negative & gram positive organism. It's various use include Uveitis, marginal keratitis, allergic conjunctivitis, blepharitis etc. Ear: Used in Otitis externa and other steroid responsive inflammatory conditions where bacterial infection is present or suspected. Nose: Used in steroid responsive inflammatory conditions where infection is present or suspected. 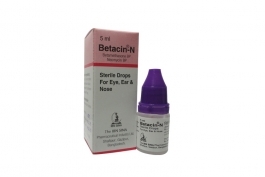 Betacin-N is available as 5 ml Sterile Eye, Ear and Nasal Drops. Bimolet is a combination product of Brimonidine & Timolol. Brimonidine is more selective for the alpha-2 adrenoceptor. Timolol is a beta 1 and beta 2 non-selective adrenergic receptor blocking agent. Bimolet is indicated for the reduction of elevated intraocular pressure (IOP) in patients with glaucoma or ocular hypertension who require adjunctive or replacement therapy due to inadequately controlled IOP. 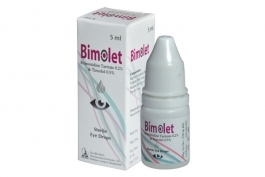 Bimolet is available as 5 ml sterile eye drops. Azopress ED (Brinzolamide) is a class of anti-gluocoma drugs, inhibitor of carbonic anhydrase II. Indicated in the treatment of elevated intraocular pressure in patients with ocular hypertension or open-angle glaucoma. 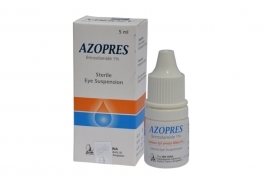 Azopres is available as 5 ml sterile Eye Suspension. 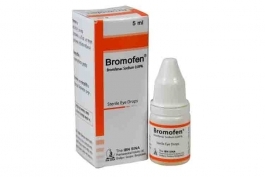 Bromofen eye drops (Bromfenac sodium INN) is a sterile, topical, non steroidal anti-inflammatory drug (NSAID) for ophthalmic use. Iindicated for the treatment of post-operative inflammation and reduction of ocular pain in patients who have undergone cataract extraction. Bromofen is availave as 5 ml sterile opthalmic solution.